I believe that leaders usually drive decision-making models in workgroups from top down. The decision making style of a leader tends to be replicated down the line as leaders are the people in an organisation who set the standards and give example to other workers. Unfortunately most leaders set standards and examples based upon their own experience, not on best practices. I have observed several managers who have been promoted from within make a repeated mistake around decision-making. As the weight of their role changes from a specialist to a manager they retain their old decision-making style managers can often retain their specialist decision-making approach. I observed a manager who had been promoted out of a network management team to manage that team continue to make ‘garbage can’ decisions where she assumed the answer to a problem as soon as it became known a problem had occurred. Over time technology and performance issue trends changes and her decision-making became less effective. People like this either learn from their mistakes through self-awareness or by others advising them, or become dissatisfied in their role and start to develop a siege mentality where they think other people are working against them, and possibly even sabotaging their efforts. I made a similar mistake when becoming a manager of a team of analysts. I had worked on developing business systems and had worked within a strategic team with a business wide focus. When I moved into a team within a smaller business unit I made decisions about which solutions to pursue that went through a process similar to the rational model. My decisions may have been technically correct, but had not been socialised properly with the right stakeholders. My mistake was ignoring the political aspects of decision-making. 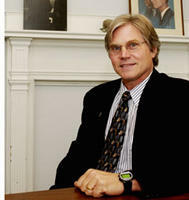 Professor Richard W Scholl (pictured) of Rhode Island University describes that decisions are made up of three main components: criteria, alternatives and cause and effect beliefs, and that for decisions to be effective both the rational process and the political needs of the stakeholders both need to be satisfied. He suggests that conflict in decision-making is usually a result of value-based criteria, or predictive.